The Ming Dynasty, declared in 1368 in Nanjing, would prove to be the last Han Chinese imperial rule of China. Already in the early 1400's the 3rd Ming emperor moved the imperial court to Beijing. Hence, all Ming emperors were buried in Beijing except for the first, who was buried in Nanjing. These pages explore each Ming Emperor's mausoleum along with a brief recap of his reign. 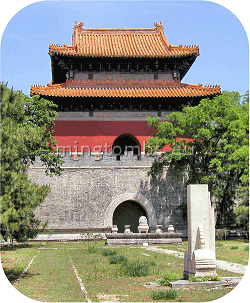 But we will go beyond that by also exploring Ming tombs of consorts, family members, generals, eunuchs, and even a king. And for those interested, we will revisit the annual rites, provide a tomb dictionary, touch upon geomancy, Ming tomb layout and similar concepts on the information pages. Tombs may not rank high on the list of great places to visit. I hope however that my pages will inspire you to pay a visit to some of them. Trust me, it's well worth it.